The Race of Mice is a classic of the pedagogy of robotics, in the step of phase CONTACT of the Pedagogic Progression of Objective Sciences International. 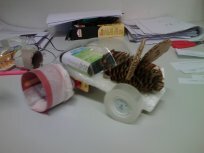 For the OSI’s ESA Space Camp in Switzerland in 2016, as part of the ESA educational kit for the camp, there was an activity proposed by Fausto Quattrini and David Houlimer. In this activity the participants were divided in groups of around 6-7 persons and where giving any necesary parts of a motor to construct a little vehicle for winning a mice race. They had 2 hours time to fulfill the task. For the rest of the elements of the vehicle, as you can see in the image, they could use whatever they found in the room. The physics behind the set up, are related to the physics of a bike or a car through what is called Gearbox design. There you have different discs combination that will adapt the speed of the motor to transfer the adecuate mechanical and termical power. 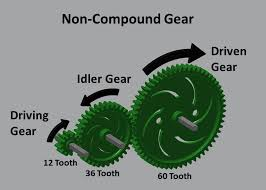 The size of the gears and the sequence in which they engage define the ratio of the angular velocity ωA of the input gear to the angular velocity ωB of the output gear, known as the speed ratio, or gear ratio, of the gear train R .
First I observed that due to that the kids already know each other from several years and they are alocated in the rooms for gender and at least a main common language (not always being their real mother tongue, but to which they are certanly fluent in) when they where encouraged to divide in groups, they would try to stick to those previous divisions. For me the task of a formateur is also to balance the fact that you work good with friends to the fact that not always in your future science career you will be working with people that you know in advance. Furthermore is to put the kids out of their confort zone, challenging that they cannot be ignoring or not collaborating with other people, that could be the key on their projects, just because of their gender or country. Because the task was a “learn by doing” proposal, where the importance relies at that there is not just a unique solution, but every team, by team working, could come with a sucessful set up to try to win the race. And so experience how to divide the responsabilities among them. In addition, the instructions where provided in German  and so, you could improve the experiment by putting some groups whith no member that speaks german and see if they come out of their group and try to gain the services of german speakers. Also you could extend the experience by setting an ammount of budged to buy new pieces or by making teams with more technical tools, teams more balanced and teams with more natural resources, to approach to the world of global manufacturing. In one group I put 2 girls in the group, they were reluctant in the begining, but ended up talking with other 2 boys and doing a design of a car, while the other 2 boys where designing the motor, without communicating the others what they were doing and complaining about their design. This can be compared to a luxus auto where the design team is focusing on selling a expensive auto but who would not think at all about what is it for. On the countrary there was other group where I put a german speaker boy, alone to a group of girls where non was able to speak german and they were the group that made less advance on constructing the vehicle, they were focusing all together in hearing the boy but not on dividing tasks. There was a group less numerous of 2 girls and 2 boys which for some reason worked medium well. The numerous group of only girls, which they were friends and didn’t wanted to divide, where also not thinking in task division and thus although they had no problem to understand the instructions in their own language. Groups where not really much interested in descovering the physics behind the Gearbox through texts but rather they where randomly trying set ups for the vehicle. All in all the experience hat a lot of potential implementation for schools too and it has an inherent fun factor. But for me in the form that was made it was not succesful in reaching the status that every team ended up producing a full vehicle for the maze, so for some reason there were distracting factors to cope with it or it might need more time for the group that we had. In this case the language is arbitrary, only due to the company that manufactured the motor components.